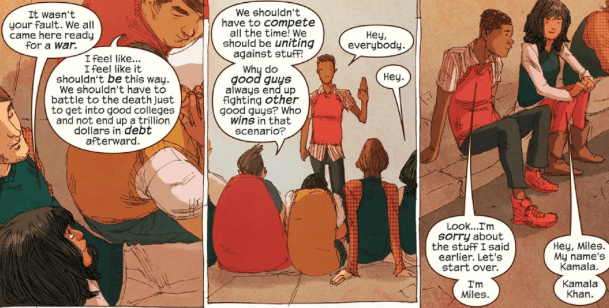 The last arc of Ms. Marvel helped this series find it’s footing again. It reminded fans why we loved Ms. Marvel in the first place. Issue 7 ties into the Road of Civil War 2. 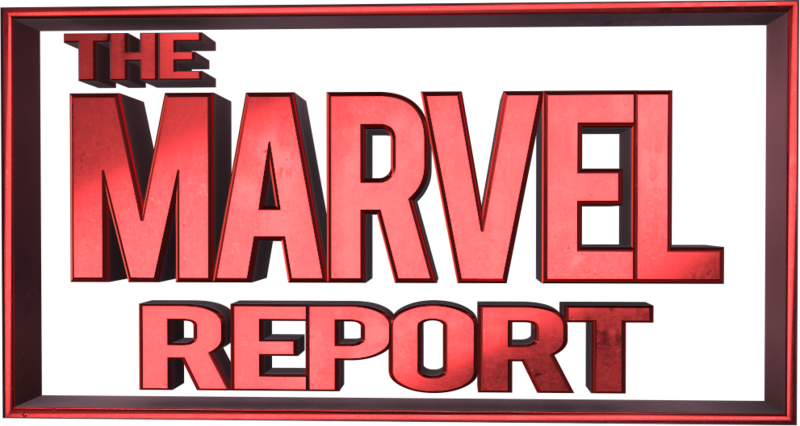 Let’s find out if this continues Ms. Marvel’s good story telling and is a good tie-in to Marvel’s next big event. 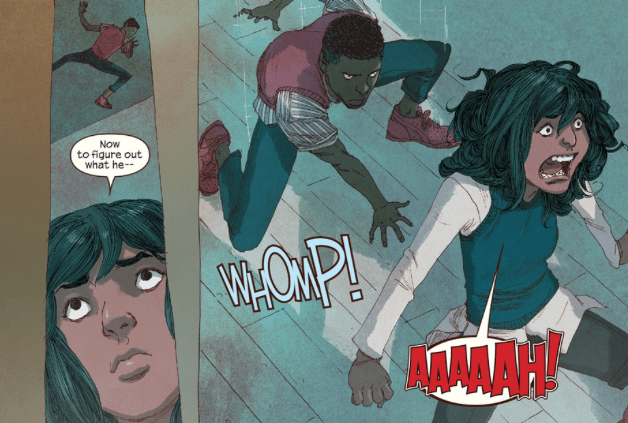 Kamala and her Avengers teammate, Miles Morales, coincidentally are participating in the same science fair. 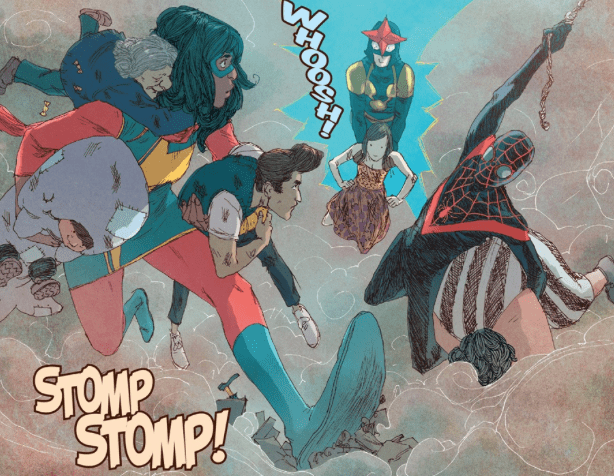 Kamala knows Miles’ identity, but Miles doesn’t know hers. 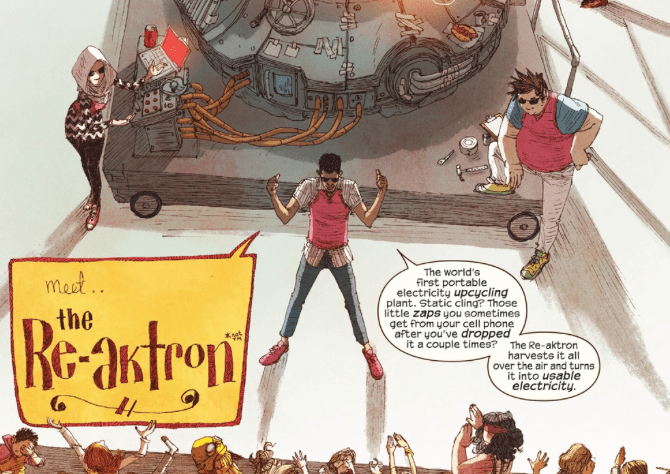 An experiment explodes at the science fair, and now Kamala has to decide if she will tell Miles her secret identity. This was a fun issue! Was it a necessarily a tie-in to Civil War 2? Not really, but I liked that this issue was a pseudo civil war for Miles and Kamala in their secret identities. They are “fighting” against each other to win a scholarship. This is important to Miles, Kamala, and Bruno. The book makes an interesting commentary on civil war. Ganke mentions in the issue, “We shouldn’t have to compete all the time! We should be uniting against stuff! Why do good guys always end up fighting other good guys? Who wins in the scenario?” This is an obvious commentary on things to come with Captain Marvel and Iron Man. 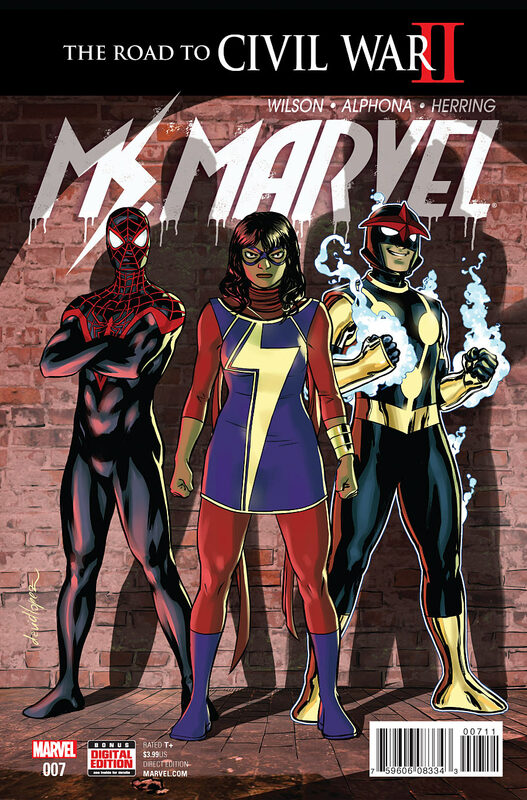 Something I didn’t like about the first arc of this series was the imbalance between Kamala’s secret identity life and her hero life (which was obviously the point of the series up to this point), but it still felt like Ms. Marvel lost some of it’s magic. But I am glad to see that this issue continues to show us both Kamala’s secret identity life and her hero life in perfect balance. Adding the twist of Miles Morales’ guest appearance. 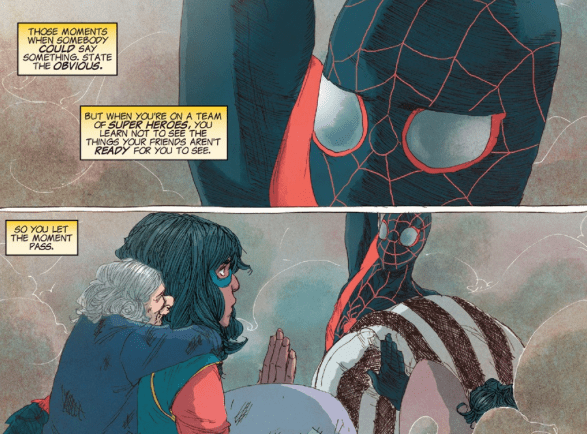 The friendship between Spider-Man and Ms. Marvel is interesting because Kamala knows Miles’ identity, but Miles doesn’t know Kamala’s identity. This makes for fun antics. It’s a nice play on the trope of a hero trying to keep their secret identity a secret. Usually heroes keep their identity a secret because they want to protect the people they love. Miles’ doesn’t need protecting because he is also a hero with abilities. Instead Kamala is keeping this secret because she believes Miles is not ready to know her secret identity. In the end of the issue they create a friendship in their secret identity lives as well. So when Kamala does reveal her identity to Miles it will bring for a more interesting reveal. It builds up tension. I loved the team up between Miles and Kamala in this issue, but I don’t think Nova needed to make an appearance in this story. It felt random and unneeded. That’s a slight negative towards the story if you are buying this issue only for the Nova’s guest appearance. A small detail I enjoyed from this issue and the Ms. Marvel series in general is how the series treats its supporting characters. This issue gives a bit more focus and depth into Josh’s character, Zoe’s ex-boyfriend. He could be the stereotypical jock character, but instead you get a quick analysis of how relationships change and people grow through his character arc. The artist on this title is one of the regular artists from the original volume of Ms. Marvel, which I have gotten use to and I think fits the style of Ms. Marvel’s book. Although I do think the artwork felt a little off with the guest stars: Spider-Man and Nova. Maybe because I am not use to seeing them in this art style. I also want to note in the last page I was a little confused by the character that appeared next to Medusa who looked like a clean cut version of Bruno. Was it another version of Bruno or was the character design similar to Bruno’s character design? I really enjoyed what the letterer did with text in this issue. Fitting the style of the artist. The letterer did unique designs whenever the science teams announced their project names. I liked the detail of of small lines in the boarder of the boxes for these project name announcements. A solid issue of Ms. Marvel and in it’s own way a solid tie-in to the idea of the Civil War comic books.